Next week, I’m going back to college to finish my degree. Sixteen years ago, before I quit school and started working, I never had any doubt about what to wear, or how to comport myself. Now, I’m in my mid-thirties and lost. What should I wear during my first week to make a good impression? Please keep in mind that I’m just a poor (returning) college student. Manolo says, from what the Manolo can see, the modern college students generally dress like the mental patients, in stain-resistant, loose-fitting clothing with drawstrings. Au currant for the young ladies are colorful sweatshirts and pajama bottoms, while the young gentlemen favor the sweatpants and novelty t-shirts. And on their feets are the cheap flip-flops, shoes that induce in their wearer the sort of shuffling, shambling gait that goes well with the shabby clothing. But then, when you are 18 years of age, it does not matter what you wear. Youthful beauty and vigor trump even in the most ridiculous of costumes, which is why the fashion designers hire willowy teenagers to model their clothing. However, for those of us whom eighteen is the distant memory, artifice, guile, and the keen eye for fashion must substitute for the natural advantages of youth. This is why the Manolo suggests that the older students adopt the “business casual” standards for the on-campus wear. Treat your time back in the school as the job. Be more serious in comportment and attire than the average student and you will succeed admirably. Here is the Nolan from Franco Sarto, the reasonably priced, mid-heel loafer that will distinguish you as the person who is there to learn, not par-tay. I love all the fabulous shoes you recommend, but as you know, things are tough out there, and I’m just a poor working girl. 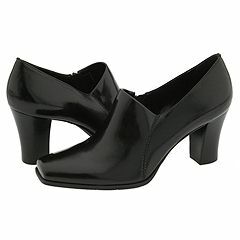 Could you suggest some office shoes that would look great for the fall, but not cost me an arm and a leg? Manolo says, although it is true that one should always buy the super fantastic shoes of the best and highest quality, in the current recession of economic disastrousness, the monies for such beautiful shoes may not always be available. And because one cannot go into the office with the bare feets, lest the managing director see your toes and become distracted, one must sometimes settle for shoes of lesser fantasticness. As always, the Manolo understands and sympathizes with such plights, for he knows what it is like to be poor, so poor that you must fashion your own super fantastic shoes out of the empty cat food cans and the condemnation notices the marshals have been tacking to the front door the “abandoned” building in which you have been living for the past month. 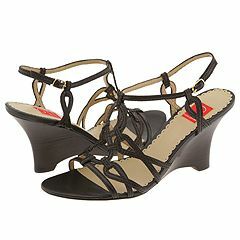 Here is Now from the Franco Sarto, the very reasonably priced work shoe with the pleasing details. It is available in the variety of colors and finishes, although the Manolo favors the black suede for this fall. Manolo says, one of the Manolo’s internet friends has asked the Manolo the question. I love to look at the expensive sandals on your site, but I’m just a working girl and shoes like that are way, way, WAY out of my price range. It would take me months to save up enough to buy those shoes, as much as I would be thrilled to wear them. So, what must I do? Can you find me some nice spring sandals for under $150? Yes, it is true, the Manolo loves to show you super fantastic shoes of great costliness, even though he knows that most of his friends will never be able to afford such luxuries; shoes that may perhaps be on one’s “bucket list”. In the meantime, while you are accumulating great wealth by writing your elven bodice ripper (perhaps, to be entitled, The Passion of Ravenscroft, followed by the sequel, The Return of the Passion of Ravenscroft) you must still wear shoes, for you are not the hobbit who can go about in bare feets. Of course, the Manolo, who knows what it is like to be poor, so poor that you must live in the earthen burrow beneath the Long Island Expressway like the urban hobbit, will be happy to recommend the few shoes of reasonable cost and superior attractiveness. Above is the Hilda from Via Spiga for all of your casual Friday needs, from the office to the Hampton Jitney. And when our poor girl arrives in Amagansett, she will need some wedge espadrilles, such as these, the Cool from Franco Sarto (available in six colors) to wear with her flowing sun dress. And, when it comes time to head to the beach (it is 90 degrees in New York today! ), our working girl will wish to glam it up the bit under her sarong, perhaps with these silver metallic thong sandals, the Winnie from Kors by Micheal Kors. I’m going to a graduate school holiday potluck with my boyfriend. I have never been to the school and I am not sure what to wear. My style is pretty conservative. What do you recommend? Manolo says, Ayyy! Merry Nonspecific Period of Non-Oppressive Festivities to all! Let the Tofurkey and Macrobiotic, Bargain-Priced Sprouts flow like organic wine! And now, let the Manolo stipulate that if the phrase “graduate school potluck” does not strike dread into your heart, you are not the feeling person. The very words alone conjure up the sort of lugubrious hilarity and culinary achievement one associates with Moldovan politburo lunches, sans the lubricating effects of vodka. It is the little known fact that graduate students are among the most miserable peoples in the world. Yes, the first year begins in high spirits, but then gradually, inch by inch, the lonely misanthropic gloom settles in, brought on by the low pay, the low status, the low self-esteem, and above all the low muffled beating of the unfinished dissertation, which, like the tell-tale heart, lies insistently beneath the floorboards of the mind. Of the course, no reason you, the non-grad student, should not be cheery. 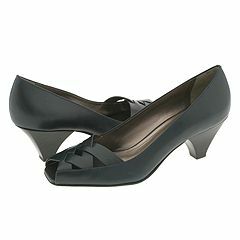 Here is the Laugh from Franco Sarto, the perfectly partylicious affordable black ankle bootie. Manolo says, here is the Manolo latest column for the Express of the Washington Post. I am a young artist working in Seattle, and my company has instituted, horror of horrors, a new dress code! I have a pair of black wedges that I love, but I need some adorable (and affordable!) close-toed shoes to go with my new chocolate brown pants and skirts. Please help. Manolo says, the Manolo is glad to hear that some companies are attempting to reinstitute professional standards of dress. Things have gotten bad, very bad , so that to judge by the costumes seen in the businesses of America we would appear to have become the nation of indigent day laborers and infantile simpletons, clad only our tattered clothes and silly teenaged sports wear. At which point the Manolo withdraws all of his money and moves to Montevideo, Uruguay, where at least the bankers still look like bankers. 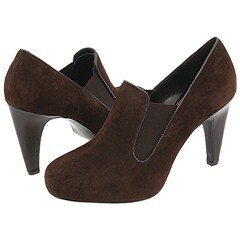 Look, here is the Enemy from Franco Sarto, the hip and reasonably-priced, suede shoe-bootie available in brown or black. Manolo says, lately the Manolo has been receiving many letter like this one from his internet friends. I love your blog, but I’ve been disturbed to see that you’ve not been making many shoe recommendations lately for us poor girls. Please help me find something that is worth wearing this fall that I can afford. It is always the best policy to save ones monies and buy the truly super fantastic shoes, shoes of great quality and style which will give you both pride of ownership and many seasons of wearing pleasure. But, as always, the Manolo sympathizes with his poorer friends, for the Manolo himself knows what it is like to be poor, so poor that you must fashion your own shoes from the skins of pigeons you have captured with the tiny snare made from shoelaces and paperclips, and cured to leather in the puddle near your rocky redoubt in the remotest section of Central Park. And so, the Manolo often recommends to his poor girl friends the shoes of the Franco Sarto, which in the opinion of the Manolo are among the best of the moderately priced shoes in terms of style and quality. Below are three pairs which the Manolo thinks attractive. Here is the Happy by Franco Sarto, the aptly-named cheerful moccasin-toed pump available in the suede or patent leather finishes. 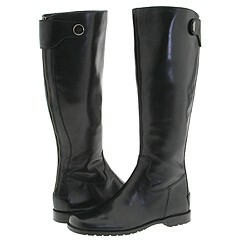 For the poor girl who is looking for the flat riding boot, here is the Hobo by Franco Sarto, attractive and affordable. And finally, for the girl who wishes to wear something that stands out from the crowd, the Manolo gives you the Amenity. And if the red is too much, it is also available in black and sand colors. In two weeks, I am to graduate high school. 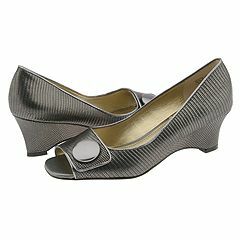 Can you please suggest a fun and inexpensive shoe for the boring yet significant graduation ceremony? Manolo says, ayyyy! Congratulations to the Manolo’s young friend on her academic accomplishments and the impending transformation into the quasi-adult state that immediately follows this event. One day you are worrying about your calculus final, and the next you are worrying about your summer job as the camp counselor, where you will invariably meet the hunky older “dude” who rides the motorcycle, rolls his own cigarettes, and knows how to dance the lambada. Sadly, or perhaps fortuitously given your friend’s long-term career prospects as the short-order cook, this romance will be transitory, as come September it is off to college where you will encounter the yard-long beer bongs, Lit Crit, and roommates who are enthusiastic participants in the culture of “hooking up”. By the middle of November, you are back to worrying about your finals, although happily your study partner is the tall, blond, exceedingly hunky squash player, on whom you have the small crush, even if he is so WASPy that his lips do not actually move when he speaks. Look, here is the Baby from Franco Sarto! Manolo says, one of the Manolo’s internet friends has asked him the question. I am a young plant ecologist. I generally trudge around the forest in hiking boots whose original appearance is well disguised by a thick layer of mud. But soon I’ll be presenting at several scientific meetings. I am, of course, terrifically nervous and very anxious to make a good impression on future colleagues. If I am particularly impressive, I may be paid for my work (a novel idea after being an undergraduate for so long). I am having quite a lot of trouble choosing a shoe. You see, I don’t quite fit into a gender. I think “soft butch” describes me well. So what shoes should I choose to wear with my lovely, but almost masculine black suit? The Manolo loves the ungendered peoples of indeterminate gendering, with their girls-will-be-boys-will-be-huh? aesthetic. So wonderfully confusing! And this story of the Manolo’s friend, it is marvelous. Indeed, it sounds like the Hollywood Indie Comedy, with the ambiguously gendered person living in the Edenic wilderness, with the plants and the hiking boots, who is forced by circumstances to emerge from this sanctuary to save the world from ecological disaster and/or deliver the academic paper. But first, s/he needs suitable shoes for hir feets! Luckily, the recent fashion trends, in which many of the best designers have shown masculine shoes for the women, means that there are many handsome shoes suitable for persons of ambiguity. Behold, the beautifully constructed cap-toe oxford from Gravati!. Yes, it is somewhat costly, but this is the sort of shoe you will have your entire life. Of the course, living in the forest generally does not pay well (just ask the chipmunks and the dryads), so perhaps the Manolos’ friend would require something slightly less costly, like this simple, handsome shoe, the Cloak from Franco Sarto. Manolo says, lately the Manolo has been getting many letters such as this one. I love your blog, and the beautiful shoes you show on it, but most often they’re well beyond my poor working girl means. Could you please recommend some shoes that are affordable but still stylish? It is true, the Manolo most frequently chooses costly, perhaps even outrageous priced shoes, but this because the Manolo believes that quality and style and workmanship trump all other considerations. The best shoes are designed by geniuses, and manufactured by true craftsmen from the first-rate materials, and because of this they command the proportionally high price. But, likewise, they give proportionally more pleasure to the wearer. Nothing matches the feeling one has when wearing beautiful and beautifully made shoes. One walks taller and straighter in such shoes, which is why the Manolo always recommends saving to buy the super fantastic shoes. However, at the same of the time the Manolo also knows what it is like to be poor, so poor that you must fashion your own super fantastic shoes out of the discarded typewriter parts you have found in the abandoned warehouse where you hide at night from the roving bands of street thugs, whom you have frequently insulted with rude gestures. And so the Manolo often recommends the shoes of the Franco Sarto as being the suitable stopgap while one saves up for the more substantial feetwear investment. Look! Here are two pairs the Manolo would recommend to his poor girl friends. Here is the Fleet from Franco Sarto, with the sleek lines and the remarkable and attractive deep red color. This boot is called the Fare, and it has the similarly streamlined lines as the red shoe above. It is elegant and modern in the best ways. The shoes of the Franco Sarto can be quite attractive and the quality is not excessively awful, thus they are perfect for the poor girl who wishes to do better. I must soon sit for my oral examinations to determine if I will receive my masters degree and am permitted to begin my doctoral degree. So, as you can see, I need serious shoe help. Manolo says, It would have helped if the Melissa had mentioned her course of study, as the shoes one would use to impress the electrical engineers are very different from the shoes needed to sooth the professors of Marxist theology. Still, the clothing should be sober and professional, something that recognizes and honors the importance this rite of passage. Also, this is one of the few cases where the Manolo would tell his friend not to wear the shoes that are so super fantastic as to make her examiners jealous, for few things can become more dangerously petty than the professor who is jealous of the graduate student. In such cases they are like the cornered ferrets. Better to appear just super fantastic enough to make them feel that you are worthy of the high honors they are bound to give you. Here is the Helix from the Franco Sarto, the pretty yet serious mid-heel pump with the tiny bit of the peeping toe and the reasonable graduate-student price. Manolo says, it is almost Spring, and as is usual the change of the seasons has brought the Manolo many emails from his poor girl internet friends asking the Manolo to help them find the affordable shoes. In such cases the Manolo always gives the same response, which is to tell the poor girl to save her moneys so that she might be able to purchase the truly super fantastic spring shoes. Do not forget that the beautiful and well-made shoes make the wearer stand taller, walk with more confidence, and enjoy life more fully. But, at the same time, the Manolo also knows what it is like to be poor, so poor that you must construct your own super fantastic spring shoes out of crocus petals and crushed robins’ eggs. And so he offers here the few spring selections which can be worn by the poor girl until she can afford better. Here is the low wedge peep toe from the Franco Sarto in the “pewter lizard” that the Manolo finds both striking and wearable. This attractive sandal from th O Oscar the Manolo shows you here in the blue color which is popular this year. Would these not herald the coming of spring? Here is another handsome shoes from the O Oscar by the Oscar de la Renta, the wedge heel sandal with the brown strappiness. Any of these would get the poor girl through the season and into the summer when she will have saved enough of the moneys to afford better. I’m a poor girl starting at the bottom of the corporate ladder, and I need something that is both cheerful and not terribly expensive to wear to work this spring. Manolo says, ah the bottom of the corporate ladder. How the Manolo remembers those long ago days in his first job, starting on the lowest rung as the Second Assistant Shoeshine Boy in the shoe shop of the Mercurio Albornoz y Bahamonde. Yes, the pay was not much—the few fistfuls of pesetas and all the lunchroom leftovers he could steal—but the opportunity for advancement was unlimited. And through hard work and dedication and the long and arduous hours of polishing the Manolo eventually managed to climb the ladder of success, all the way up to the exalted position of Associate Shoeshine Boy in Charge of Laces! He even had his own corner box on which he could squat while he labored! Ayyyyyy! Those were heady days of success for the young Manolo. But, then, sadly, the shoe shining was outsourced to street urchins and the Manolo found himself having to start all over again at the ripe age of thirteen. But such is corporate life. Here is the Cargo from the Franco Sarto, the cute and breezy wedge heel shoe that would enliven the spring day of corporate climbing.